This was an unexpected recording gig, and some of the most fun I’ve ever had capturing someone else’s music. It was my first time recording the bulk of an album live off-the-floor in well over a decade. 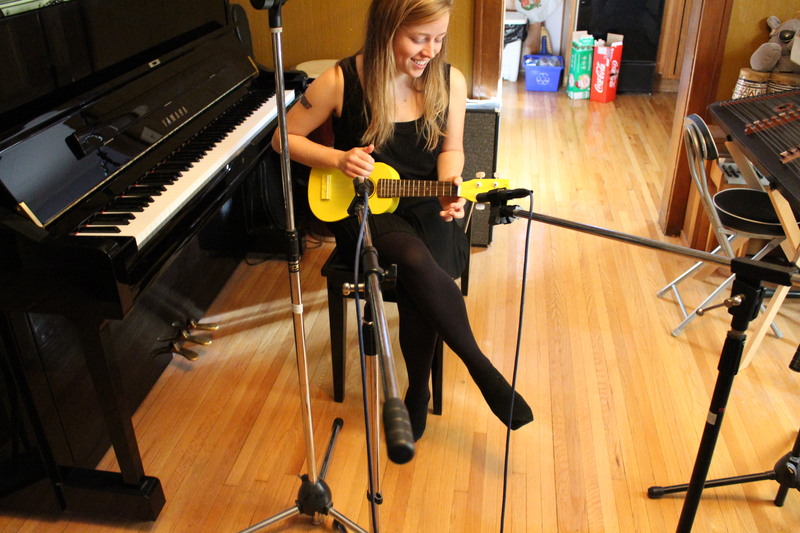 We tried getting down the guitar and vocal tracks in separate passes at first, but it was clear Jess was a lot more comfortable singing and playing at the same time. So, with the exception of the second-last song — where the ukulele was recorded first and the vocal track was overdubbed after the fact — and another song I was asked to contribute to, there are no overdubs at all, and what you’re hearing is what happened in the room on the day it happened, just as it sounded to us as it was happening. Jess plugged her Danelectro electric guitar into my Fender Twin, I stuck a few mics in front of the amp, moved another mic close enough for her to sing into, and away we went. Jess has a band called Yess Woah, which features Juliette Grasso on drums. When she records as Yessica Woahneil things are more stripped-down and it’s generally just Jess on her own. Her songs are always full of unpredictable dynamic and tonal shifts, and I think her unique energy comes through regardless of how many layers of clothing the songs are wearing. Here the goal was to make a recording that was as honest and straightforward as possible, with no frills or sonic trickery. The only effects used were some compression to keep the levels in check and a kiss of reverb supplied by a pedal we ran into the guitar amp when the built-in spring reverb was a little too noisy. I did add a bit of reverb to the vocal track on “Washing on Shore” because it seemed to sit better in the mix when it wasn’t completely dry. That was it. For the most part Jess wanted this to be a solo affair, but she did ask if I could add drums to “Sun Coming Up”. It was one of the most challenging songs I’ve ever tried drumming on, and one of the most engaging. With all the sudden changes in tempo and intensity, settling into a comfortable groove and putting together any kind of conventional drum part was impossible. The only way to approach it was to treat it as a two-way musical conversation, doing my best to stay with her while improvising and responding to what she was doing. There was no way I was ever going to get it perfect, but after living with the song for a while I felt I knew its twists and turns well enough to navigate them with some amount of confidence. I also added some bass to anchor the low end a little. I keep expecting someone someday to want someone else to master an album I’ve recorded for them, if only to get things louder than I’m willing to go. It hasn’t happened yet, to my relief and mild surprise. This is one of the most dynamic albums I’ve recorded in recent years. To narrow those dynamics down just to make the overall volume a little higher would miss the point and, I think, rob the music of some of its power. Recording almost everything live limits what you can do come mixing time. It also makes it more difficult to screw things up. While I didn’t do much more than move a few microphones around and hit the record button (“Sun Coming Up” aside), between the spiky sound of Jess’s clean electric guitar and her whisper-to-a-shout vocals I feel like we captured the important stuff. And Jess is a total pleasure to work with and be around. She’s one of those people who brightens up a room just by stepping into it. 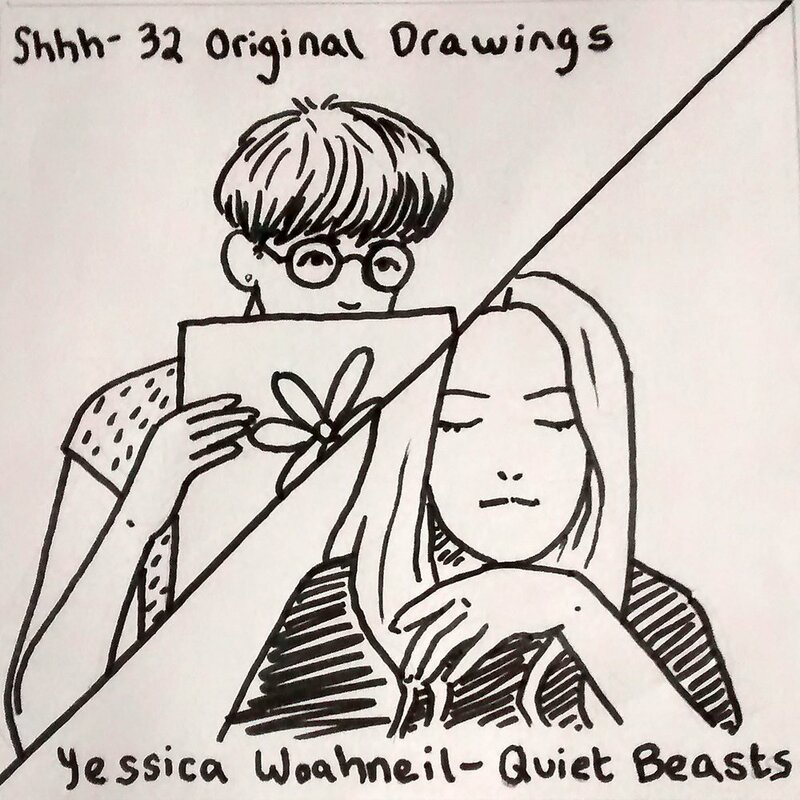 This album is available as both a split cassette (with QUIET BEASTS on one side and the Shhh album 32 Original Drawings on the other) and a standalone digital release.